We Deliver Systems Optimized for These Challenges. It is critical that businesses running design and engineering software (CAD, CAE, etc.) select the right workstations to drive their operations. 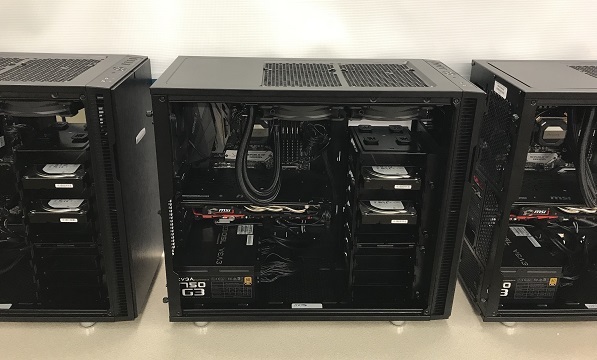 Many Rochester area manufacturers trust Microworx for CAD workstations that are designed specifically for the challenges at hand – workstations with a certified graphics card, enough processing power, and the memory capacity needed to handle such demanding requirements. We can design, build, and install exactly the systems you need, and then implement monitoring, back-up, and upgrade programs to keep them running at peak efficiency. You’ll enjoy more productivity, and save money in the process. Microworx is your ideal partner to design and implement server solutions that are right for your business, not one size fits all. From owner operated businesses to 1000 employee organizations, Microworx has a strategy for you. Microworx provides server hardware, server hardware with pre-loaded Linux or Windows operating systems, or even a complete turnkey solution with data migration and installation included. With 25 years of experience, no matter what your needs, we can help. Routers, switches, hubs, access points, extenders, bridges, transceivers, cabling – we understand it all. To get you started, Microworx offers businesses a complimentary site survey to evaluate your network needs. So we can put together the perfect plan to make your network fly. Many small businesses benefit from outsourcing their IT Service Management. You can focus on what you do best, while feeling confident that Microworx is doing what we do best-preventing and solving your IT problems. And better yet-we’re local! When you team with Microworx, you will never be outsourced. We offer a comprehensive, affordable solution for supporting and managing the overall health of your entire network. With a combination of tools, we monitor, manage, and track all the components of your IT infrastructure to ensure your systems are optimized and your business can perform at its best. With our proactive approach, we help to prevent IT issues before they happen. We understand that your computer is critical to you and we offer many service options, pre-scheduled service, and while-you-wait service to ensure that we get you the turnaround that you need and is possible on your system.